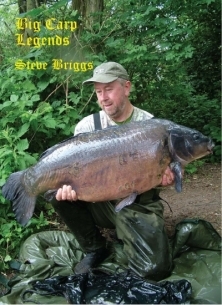 Steve Briggs is more than just a Big Carp legend, he is a carp fishing phenomenon. A master of techniques, this modest angler has become the most successful angler ‘worldwide’ that we have ever known. Captor of fifty-pluses from five different countries, multiple winner of the prestigious International Carp Angler of the Year and two-time World Champion, Steve’s reputation stretches across the globe. But it is here in the UK that Steve has quietly gone from water to water catching the best of the best – Darenth, Johnsons, The Railway, Harefield, Summerleaze, Wraysbury and The Mere – the list goes on. Here in his own words is his incredible life history; a life dedicated to pursuing the world’s largest carp.